If I had a nickel for every time I have said that phrase. But yet, they still don’t listen, and here I stand feeling guilty, because once again I yelled. I am not judging those who yell. 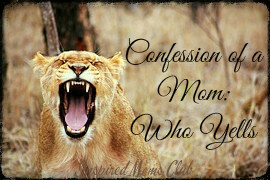 I just confessed, I am a mom who does yell. But I can say, it gets me nowhere and is not God’s idea of trying to get the point across. This verse maybe doesn’t have anything to do with yelling, but I know in my heart, God calls us to be gentle souls, yet stern when needed. I have learned that yelling at my children raises the level of frustration in the entire house, kids included. When nothing is done, the level of my anger rises. I have also learned my kids respond more to me when I am gentle but stern. When I try to gently speak and tell or ask them to behave, etc. I notice the outcome is better. Does it work every time? No, my four-year old will still have his meltdowns, throw himself down and roll on the floor. But when I yell, he doesn’t automatically say, “Oh she is yelling! She means business!” The louder I get, the louder his fit becomes. It’s a lose lose situation. I was doing a bible study with a group of my friends. It taught the different attributes of a lady and what God calls us to be. It was an amazing study and the one thing seemed repeated many times was gentleness. Hmm. And Self control. If I am yelling, do I have a gentle spirit? Do I have self-control? If the answer is “No!”, then I know to change my reaction and deal with the situation differently. Will I get this right every time? Oh gosh no! But it is a work in progress to become the gentle women God has called us to be! I simply write this as a confession and maybe a help to you. When you feel you want to yell, pray at that moment. Ask God to help with a gentle spirit, and a different way to approach the situation. We can learn and grow in this together! Wow. I needed to hear this today. Thank you.